Having developed a case of chronic aerophobia, Amanda Hooton decided it was time to stop flying by the seat of her pants and re-establish control. I was not always afraid of flying. When I was young I was completely unlike Doris Day, who was unable to attend the ceremonies for her Presidential Medal of Freedom and her Lifetime Achievement Grammy because of her aerophobia. Or Stanley Kubrick, who refused to fly when filming Full Metal Jacket and had to re-create Vietnam in the fields of Norfolk; or even Kim Jong-il, whose otherwise substantial powers of mind control did not extend to convincing himself that the iron bird would fly. Nor did I have what psychologists call an “inciting incident” for my fear – a personal experience or near miss that gave rise to my anxiety (though it must be said, history is hardly littered with aviation near misses). Nothing terrible ever happened to me, yet as the years passed I got more and more anxious. I often wrote letters to my family on cocktail napkins … explaining that I loved them and that I’d had a great life. Largely, I was worried about turbulence, which is depressingly unoriginal: according to one international study, 40 per cent of people fear flying, 6.5 per cent are too afraid to fly at all, and most of both groups fear turbulence. I had all the classic aviatophobe’s thoughts: the wings snapping off the fuselage like toothpicks; the tail suddenly shearing away; chunks of aeronautical innards hurtling into the sky as we plunged into our inevitable death spiral. I often wrote letters to my family inside book covers and on cocktail napkins, explaining that I loved them and that I’d had a great life. Somehow I imagined that when the plane did explode, these napkins would miraculously survive the subsequent plummet into the ocean (I always imagined crashing over the ocean), and would be delivered, dripping gently, to my grieving family. Most bizarre of all, I evolved a process by which I had to touch the outside of the fuselage of every plane I boarded with my finger – usually the littlest finger on my right hand. I chose not to wonder what the flight crew thought, watching me slide my hand along the rim of the door as they chivvied me towards seat 57D. In the end, and despite all these baroque procedures, things got bad enough that I was prescribed Xanax to take before flights. This did not eliminate my fear, but reduced my ability to care. Instead of thinking, “I AM GOING TO DIE!! !”, it made me think, “I am going to die.” But then I had a baby and could no longer take Xanax; and I missed the chance to fly around Everest with Peter Hillary, son of Edmund, one pearly Himalayan morning. Peter Hillary had lost his mother and sister in a plane crash, yet he was on that plane and I was not. Clearly, something had to change. Usefully, page one of the Flight Experience Fear of Flying course manual contains a list titled Common Flying Fears, and the very first one reads: “The plane will crash and I will die.” Go no further, I tell Nikki Johnson, the psychologist who helped develop the course, which has just started in Australia. That’s me. Johnson, a stylish, dark-haired woman wearing reassuringly confident glasses, nods. Most of my rituals, she explains, are what are called safety behaviours, and they’re a common way to cope with anxiety, in flying and in life. In my case, they’re mostly linked to feeling fearful about not being in control. “Do you feel like it’s your job to keep the plane in the air?” she asks. Are you saying I’m a control freak? I ask. Johnson grins. I am also, it seems, a perfectionist and a catastrophiser, an unappealing combination that’s particularly bad for flying, where you have to not only relinquish control, but trust in someone else’s expertise and have faith in positive outcomes. Captain David Evans provides the most compelling reason I’ve had for years that I might not crash. Part of the course’s information-gathering phase involves talking to an actual pilot, and by the end of my session with Evans, I feel like clinging to his leg and demanding that he be in charge of every flight I ever take for the rest of my life. Evans has more than 30 years’ and 20,000 hours’ of flying experience. 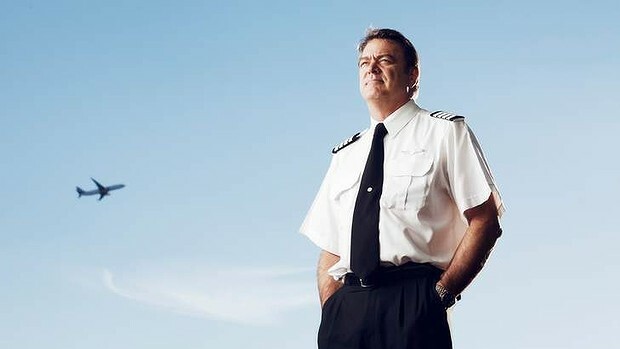 He was the most senior pilot aboard QF32, the Qantas A380 crippled by an engine failure leaving Singapore in 2010. Today, in an office on Coward Street (!) in Sydney’s south, his job is to answer my “Why don’t the wings snap off?” questions, and provide me with some realistic evidence to counter my doom-laden thoughts. That can be hard to remember when you’re bouncing up and down in 57D, I say. The simulator does help with that. Secreted in a harbourside shopping mall, a replica cockpit of a Boeing 737 has been set up to run virtual flights that contain all the visual and flight information you’d get on a real flight, bar the 10,000 metres of air between you and solid ground. Gazing at the banks of switches, I catch sight of one labelled “ANTI COLLISION”. For one terrifying moment I think I’ve discovered the solution to every impact crash ever suffered by a 737. “It’s to stop ground services approaching while the engines are running,” D’Arcy says patiently. After fielding more inane questions – “A clipboard! How much of my safety depends on a clipboard?” and “What would happen if I went mad and ripped this lever out with my bare hands?” – we start the preprogrammed flight of my worst nightmare: turbulence, a thunderstorm, steep banking, a missed landing and an engine failure. Through it all, D’Arcy coaches me about how turbulence-competent the aircraft is; how avoiding thunderstorms and turbulence is for passenger comfort rather than aircraft safety; how planes can roll right over but are restricted to 25-degree banking for passenger peace of mind; how routine missed landings are; how it’s possible to take off, fly and land using only one engine. It’s a terrific information-gathering experience, and provides me, as Johnson explains, with valuable exposure to my fear. This in turn helps me believe that I, and the plane I’m on, can actually survive a flight. Nonetheless, I can’t shake a lurking awareness that I am not, in fact, on a plane. Will any of this help when I really am? And lying beneath that lurking awareness is another one: that in 48 hours, when I fly to Perth, I really will be. And what do you know. I can hardly believe it, but the fear is gone. It’s as if the space in my head once taken up by blind terror is now occupied by a kind of personalised flight manual. I get off the plane feeling like Yuri Geller, as if I’ve performed some kind of spoon-bending magic trick. Three weeks later, it’s the same on the return flight. Despite accidently seeing the unbelievable footage of a 747 cargo plane falling from the sky in Afghanistan three days before I fly, I do not think of death once while I’m in the air. Next time, I’m not even going to touch the fuselage.